It's like Rocky vs Apollo Creed! Who knew the car service industry could be so cutthroat? Right now, there’s a heated battle between Uber, the company that’s already made a name for itself not just for its service but for the way it goes about protecting its business, and Lyft, the newer startup in the game. Lyft has lobbed accusations at Uber, accusing 177 of the company’s employees of making more than 5,000 requests for rides and then quickly canceling them. This sort of thing costs the drivers money and wastes a ton of time. At first, Uber said that it must’ve been indecisive customers. But upon further inspection from CNN and Lyft, there’s a good possibility that Uber workers were the culprits. And, according to Valleywag, when these Uber recruiters do keep their reservations, they use the ride as an opportunity to try and get drivers to leave Lyft. Now faced with evidence, Uber decided to issued a press statement that goes for Lyft directly. Shots fired! 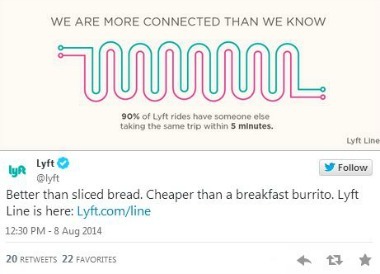 Lyft’s claims against Uber are baseless and simply untrue. Furthermore, Lyft’s own drivers and employees, including one of Lyft’s founders, have canceled 12,900 trips on Uber. But instead of providing the long list of questionable tactics that Lyft has used over the years, we are focusing on building and maintaining the best platform for both consumers and drivers. Dang. Lyft countered by telling The New York Times that it has more than 100 investors who are “extremely excited” that the company is growing to a point that revenues will soon reach “IPO level,” and both drivers and passengers are very happy, thank you very much. Uber has been around longer than Lyft. With its company still growing and expanding, it’s clear that they will aggressively protect their territory. But the company doesn’t want to get too aggressive. This is the time when it’s building a reputation, and going after a competitor using every trick in the book and then actively dissing them in the press will rub people the wrong way. At some point, inevitably, Uber is going to need a little goodwill and it won’t be forthcoming throwing punches like that. Honestly, both sides should reel it in. There’s more than enough room for two companies in the car service game.